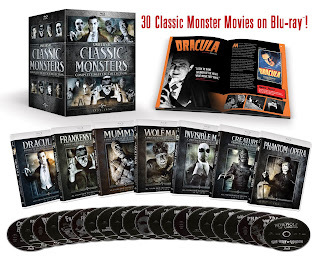 Thirty of the most iconic cinematic masterpieces starring the most famous monsters of horror movie history come together on Blu-ray™ for the first time ever in the Universal Classic Monsters: 30-Film Collection on August 28, 2018, from Universal Pictures Home Entertainment. Featuring unforgettable make-up, ground-breaking special effects and outstanding performances, the Universal Classic Monsters: 30-Film Collection includes all of Universal Pictures’ legendary monsters from the studio that pioneered the horror genre with imaginative and technically groundbreaking tales of terror in unforgettable films from the 1930s to late-1950s. Very few movies stand the test of time as well as the Universal Monsters do. For close to 90 years, the likes of Dracula, The Mummy, Frankenstein, and their spooky pals have surpassed so many other characters to become, to many, the end all be all of horror icons. Thanks to seemingly endless merchandising, multiple depictions in various media(sometimes unlicensed) and remakes, these characters remain to be favorites of those who seek out horror. But of course, to some, nothing beats the original and with Universal's 30-film collection, you can relive the frightening fun over and over again. For fans who may have missed the previous releases and multipacks, this is your chance to experience these classics how they were meant to be seen. With a cleaned up picture and sound to present the best film quality possible, this is the definitive set to own for Monster enthusiasts. With all these movies and bonus features, there's so much to dig into here including a fun little book chronicling the history of our favorite creatures, as well as rare lobby cards, posters and advertisements. A nice companion piece to all the information you'll soak in while watching the bonus features and listening to the commentary. In my opinion, this is the must own bluray collection for not just Universal Monsters fans, but horror fans in general. This is essentially Horror 101 in one simple package. If you wish to learn how far horror movies have come, the inspiration for most if not all your favorite slasher/serial killers, look no further. You'll learn so much and maybe even discover a new movie you've only heard of before but never watched. It makes the perfect gift for that horror fan in your life or even someone who wishes to begin an interest in horror and movies in general. No matter who you pick this up for, they'll be very satisfied!